The green beans and tomatoes are climbing up the sunflowers. The fences are covered with false cucumber, blooming sweetly. Spikes of greeny-white blossoms with a strong sweet smell. The sunflowers are 10 to 12 feet high, so I have to climb to reach the beans. I walk around and look for beans, but I have to sit too, to see them all. I sit and look, be the bean. Where are you all? It's cooler today, so the bees have retreated from the sunflowers. Yesterday I picked a big bag of beans, sweat dripping down my face. Today cool and dry. I wore a sweater. I could get around the sunflowers, no bees, and found lots of fat long beans. I picked another mess of beans today. Another big bag. What to do with the all? I asked my son if he wanted some. "Well, we don't eat many beans," he replied. That means no. I cook them hot and fast; add vinegar, honey, pinch of salt, and hot peppers. Chill. Good in salad. I used to bring extra vegies to my office friend, now moved on to another job. The garden is most beautiful in the early morning. The slanting sun hits the leaves and flowers, morning glories bloom everywhere: deep purple, hot pink, and dark blue. Intense, ephemeral, searching. It was great, but I'm back to work. Best parts of summer: family, friends, water, garden, and books. 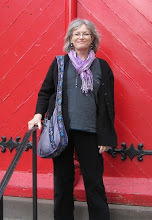 I became a grandmother, spent time with sons and their SOs, traveled to Burlington VT, visited my cousin on an island, grew green beans and flowers, bought a kayak, kayaked, taught Reiki, read novels, swam in a pond and the Atlantic, ate lobster, and rode a bike. I laughed with friends, loved my grandson, and went to a concert. It was a wonderful summer, full of love and laughter. There were difficult, sad, and scary things too. Life. My garden is a jungle of huge flowers, armloads of herbs, and vegies ready for harvest. Bees, raspberries, and humming birds. Now I'm back to work. A full-time job, 3 part-time jobs, and my usual volunteer activities. It will be a busy four months. Glad I've got my summer memories. Hope summer was good for you. Thank you, Brit and French readers, for buying my books. I hope you enjoy reading them. Reiki on. The past: recognize patterns, learn, move on. The future: who me, worry? Whatever happens will happen. The now is all that matters. Be healthy now. Open your heart now. Forgive, have faith, honor your teachers, earn your living honestly in a way that benefits others, respect all living things. Forget the past; let's just start over right now. You know that old saying, "Those who can't do: teach?" I was thinking today. 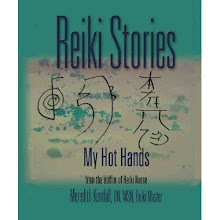 I shared Reiki with people with cancer and I taught Reiki to eager practitioners and people with cancer. Much as I love doing, I love teaching even more. I mean, I like to model "doing" as I teach. I like the hands-on style of teaching. That's not what I mean. When I'm just a "doer" I feel like a false expert. Well, I'm kind of am an expert in some things, but you know.... I don't like to be perceived that way. Like I'm an expert doer and the only best special doer. Because most things anyone can do. So I like to teach so they can. When I teach, then everyone can do. It's empowering for the student. I like to teach. Respect the power of the Reiki symbols. When you use them; open your mind to possibilities, your body to health, and your heart to love. Had such an interesting Reiki session today. There was a student at each shoulder, two new Level 2s. I was tired after a busy weekend, and happy to receive a session. Anyway, one at each shoulder. We began. I felt like I was split in half. Heat ran down my right side from my head to my tailbone. Cold ran up my left side. I felt unbalanced and so tired. The student's hands on my right felt hot, and the hands on my left felt cold. Suddenly it switched. I felt cold running down my right side, and heat up the left. Still unbalanced, but my system was trying to adjust. Then I felt warm and good all over; I was done. I opened my eyes and thanked the students. I felt joyous and jolted with energy - like I'd just had a big cup of coffee. I told them what I felt, grinning and garrulous with excitement. She came out toes up. Thin, white. Pale, frail. Still. She wore an oxygen mask and was covered with a sheet. She didn't move. The ambulance guys loaded her up. Family got into cars. Police hovered. They all drove away. That was 10 days ago. His car was gone most days, home at night. Then one night I got up for a glass of cold water and looked outside. His car was gone. In the morning his car was back and after that it stayed in the driveway. Blinds closed, no movement. Their black cat snoozed in the bay window. Then the son started to come, every day around noon. To feed the cat I guess. Tuesday morning, trash day, there was a sagging black bag of trash at the end of the drive. Where were they? I read the obituaries every day. I imagined she was dead and he was staying with one of the kids, grieving. They were planning the funeral and writing the obit. He was drinking too much and playing golf with his son-in-law. Today the son came and rushed around in and out of the house. He'd stop for a moment by the car door, then rush around some more. I wondered if they would sell the house, and I'd get new neighbors. Friendly ones. A man who wouldn't make lewd remarks. A woman who wouldn't pull up freshly planted flowers every week. Then the son came back, and brought her. She was alive! She wore sandals, bright yellow capri pants, and a white button-down blouse. She got out of the car jauntily, went to the mailbox at the street, and then skipped back to the house. She was alive and walking! She started up the steps and it was like she hit a patch of ice. Except it's August, no ice. Her feet slid to the left and her head went right and smacked down onto the driveway. Her son helped her up and she walked into the house herself, son two steps behind, arms full of mail. "Put your arm around her!" I thought. He came dashing outside a few moments later, and scrubbed a fallen birdbath with a rag. Then he ran to the backyard with a watering can. He came back and filled the birdbath, then went back into the house. They opened blinds and windows, and turned on lights. She was home. They drove off 10 minutes later, for groceries, I thought. Back in half an hour. But where was the husband? Still golfing and drinking? Moved in with a floozy? Hospitalized with a heart attack? They never came back. The blinds stayed open. Did she fall again? She fell in the deli section and an ambulance took her to the ER. She just got out of a skilled unit, recovering from a minor stroke, and had another one in the car. He's still there, recovering from a heart attack. She'll go back, with worsening syncope and more small strokes; they'll share a room. He's gone to Barbados with the bartender from the Elks. Or the volunteer clerk from the hospital gift shop, a high school sweetheart. She hit her head on a watermelon in the grocery store and didn't make it. They're all at camp. I glance out the window and worry.